Patricia George Decio, 79, of Elkhart, Indiana, passed away peacefully and surrounded with the love of family in her home on Friday, July 16, 2010. Patricia Carol George was born “with joy” on December 26, 1930, the day after Christmas, in Geneva, Illinois to Howard W. George and Florence Carol George. Growing up in Oak Park, Pat developed her impeccable taste, imagination, and life-long love of flowers from her father, a dapper businessman and champion golfer and her mother who owned a charming floral shop. It was while she was a student at Mount St. Mary’s Academy in St. Charles, Illinois (the last semester of her senior year), that Patsy met the love of her life, Art Decio, a cadet at the nearby Marmion Military Academy in Aurora, Illinois. Pat was educated at Mundelein College in Chicago, where as a drama major, she had the lead role in Peter Pan. On January 6, 1951, Pat and Art were married and moved to Elkhart to begin their life together and raise their family. Over the past 50 years, Pat and her husband, Art, have opened their home to a range of philanthropic and civic events. Pat had a gift for entertaining and was known as a creative and gracious hostess. From cooking breakfast for Rose Kennedy to hosting a gala for hundreds, Pat always made it look easy and yet elegant. Mrs. Decio has served on community, church and educational boards and committees, including Aux Chandelles for the mentally handicapped, now a part of ADEC (Association for the Disabled of Elkhart County). She was also an active leader for HOME, Elkhart Community Day Care, the Urban League and Elkhart General Hospital Auxiliary. She was a life member of the NAACP. Mrs. Decio served on the Board of Regents of St. Mary’s College, Notre Dame, Indiana, and chaired the Board’s Committees on Student Life. She also served on the Advisory Council of the Snite Museum of Art at Notre Dame and on the University’s Advisory Council for the Performing Arts. She received an honorary Doctor of Humanities degree from St. Mary’s College, as well as a 1985 Wall of Fame Award, the highest honor conferred by ADEC. She also was a recipient of the “Outstanding Kindness Award” from ADEC and the Community Service Award of the Elkhart Chapter of the NAACP. Pat’s love of the arts and dedication to education remained constant throughout her life. Mr. and Mrs. Decio funded the construction of the Decio Faculty Hall and the Patricia George Decio Theatre in the Center for Performing Arts, both on the campus of the University of Notre Dame. Pat, who called herself a “Chicago Girl”, had an apartment in Chicago and a winter home in Ocean Ridge, Florida. She was a much loved member of the Ocean Club, where she gathered friends and family for vacations for over 40 years. Pat loved the outdoors and was passionate about walking, golfing and reading non-fiction. She was known affectionately to her grandchildren as “grandpat” and admired and loved for her great faith, enormous energy and glamorous sense of style. Pat will be missed by all, but her joyous, optimistic spirit will lift our hearts forever. 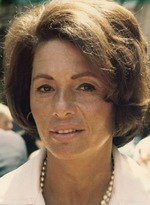 Pat is survived by her husband, Arthur Decio; their five children: Terrence (Marlene) Decio of St. Joseph, Michigan, Jamee Decio of Los Angeles, California, Lindy (Robert) Reilly of Winnetka, Illinois, Jay (Peter) Christman of Simsbury, Connecticut and Leigh (Paul) Laird of Willowbrook, Illinois; as well as fourteen grandchildren and three great grandchildren; and her sister Marilyn G. Swanson of Marathon, FL. She was preceded in death by her parents and her brother, Howard W. George. Visitation will be held at The Lady Chapel of the Basilica of The Sacred Heart on the University of Notre Dame campus on Tuesday, July 20, 2010 from 3:00 p.m. to 6:00 p.m. The funeral mass and celebration of Pat’s life will be held at 10:30 a.m. in the Basilica of The Sacred Heart on Wednesday, July 21, 2010. Rev. John I. Jenkins, C.S.C., University of Notre Dame President and Rev. Theodore M. Hesburgh, C.S.C., President Emeritus, University of Notre Dame, will officiate. Interment will follow at Cedar Grove Cemetery on the University of Notre Dame’s campus. Palmer Funeral Homes, South Bend, IN are assisting the family with arrangements. Online condolences may be offered at www.palmerfuneralhomes.com.